The growing trend of consumer is looking for natural, simple processed foods. However, these types of foods are susceptible to bacterial contamination. Lysozyme has been accepted as a natural antimicrobial enzyme and it is acknowledged as green label. Lysoch® L4 Lysozyme concentrate is antimicrobial enzyme produced by food cultures, and is mainly used to lyse both Gram-positive and Gram-negative bacteria during the process production of processed foods. 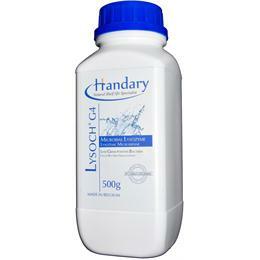 Lysoch® L4 is available in 1 L/bottle with integral, tamper-proof seals. Packaging is available in other quantities. 12 months, store unopened below 15°C in dry conditions, away from direct sunlight and odorous products. When opened, store at approx. 15°C in original container. Shelf life is 12 months when stored according to recommendations. Genetically modified organisms /2 ml (PCR method). 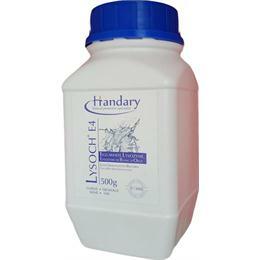 Lysoch® L4 vary considerably in the countries in which it is currently approved. Advice regarding the legal status of this product is available on request.